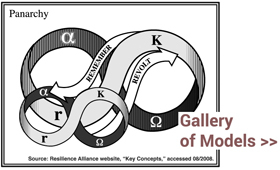 “It could be in November that this is going to be a chart that is going to come back and haunt me,” said Justin Wolfers at the April 2012 Collective Intelligence conference. Expectations are better predictors than intentions, he insisted. And his chart proved accurate (i.e., to accurately support his claim). 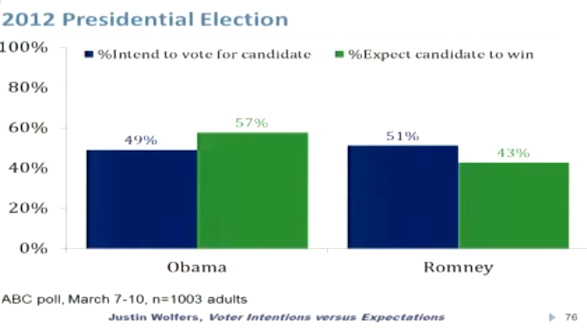 In it, poll respondents predicted Obama’s election when asked about expectations, but not when asked about intentions. Most pollsters base their election projections off questions of voter intentions, which ask “If the election were held today, who would you vote for?” By contrast, we probe the value of questions probing voters’ expectations, which typically ask: “Regardless of who you plan to vote for, who do you think will win the upcoming election?” We demonstrate that polls of voter expectations yield consistently more accurate forecasts than polls of voter intentions.